In the spirit of console games with their plastic instruments, if their were a game dedicated to getting stuff done around the house, then what ever its oversized plastic implements are, and what ever gesture is required to enter into the mode when the screen lights on fire, then I more then definitely wielded said plastic implement with expert proficiency, and gestured appropriately to enter the bonus mode. Enjoy (while squinting) its authentic spiral bound fashions. 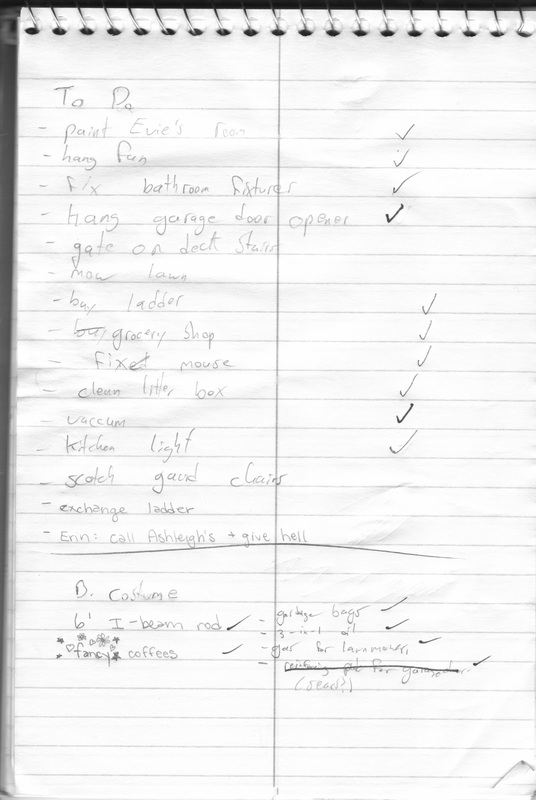 By the time we finished you could add a task or two to that list, and the only left incomplete were the last two the required stores to be open. 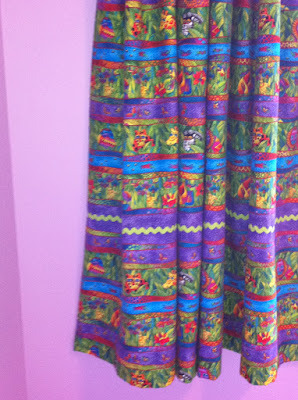 So on top of painting, we also hung the curtains Erin's mom made, so here are two pictures, and basically both of them demonstrate that it is impossible to accurately capture colour. The colour is called Easter Egg, and it is an Easter Egg Hued purple, come see it, it looks great. When we get the chance we are going to put up some vinyl stickers of palm fronds and jungle beasts. Other big tasks this weekend... Hanging a giant fan, this one required me to actually go find a ladder big enough to get up 13 feet, and then drag the 50 lb fan up there. The fan was a gift from Erin's parents, it was manufactured (I say that, rather then "made" because it is solidly built fan, with a self lubricating grooved axel the raises oil up from the well to spray on to the bearing casings, it is a serious fan) back when men were real men, and the west wasn't tamed. Okay, more like 20 years ago, and still spins silent and efficient as ever. 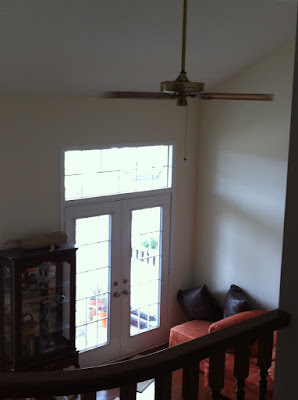 It is the kind of fan that when they say lifetime warranty, they mean the fan will continue to spin in the skeletal remains of your house a millennia from now. So those were the highlights, the task list was actually rather long, and the complexity varied, but all (including B) helped. We tackled in one weekend, like three months of jorbs, so woot! I now have some honestly earned aches and pains, and have taken with pride a pain killer, and some milk and cookies (Bryan made them,) and now I'm off to bed.